Description: This 18mm x 15mm Chip-on-Board PCB contains a standard alarm siren as used in personal alarms, drivers for piezo horn sirens, cars & toys. It has a wide power supply of between 2V to 5V. (However, one factory does use it with a 9V battery in a personal alarm with no apparent failures.) It has automatic power down & a standby current is less than 2 uA. The chip will tolerate a wide range of component values. 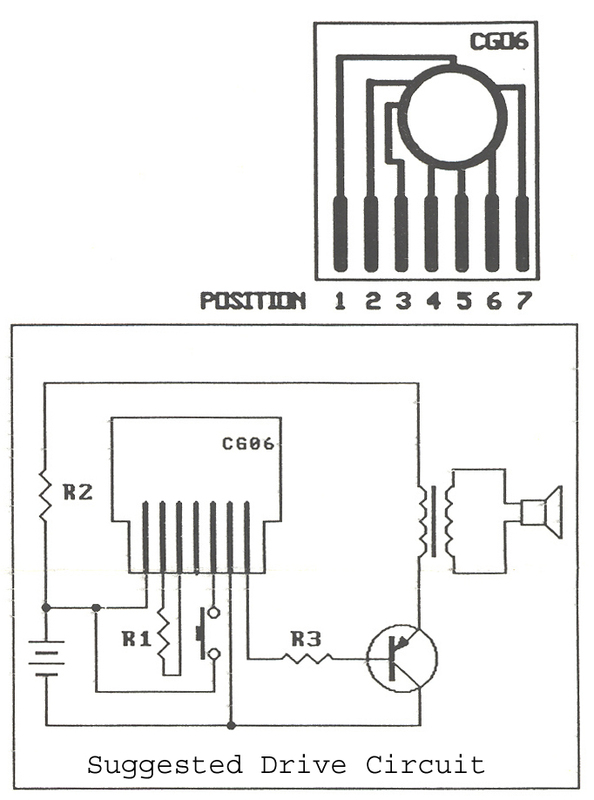 A suggested circuit is given below. R1, The oscillator resistor was 47K; R2 3K3 and R3 5K6. With a good choke coil or transformer, and a good piezo resonating chamber sound outputs of over 105dB at 1 meter are obtainable. This is the first time these die form IC's have been generally available to the hobbyist market.